24 Karat Gold finished award figure in the Classic Pose holds a shining star of Achievement proudly. Mounted on ebony finish round base. 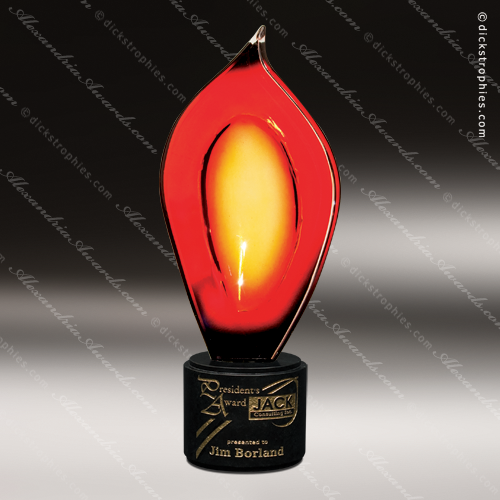 9 1/2" Tall - Imprint: 3 1/4" x .5"
10 1/2" Tall - Imprint: 3 1/4" x .5"
13 1/2" Tall - Imprint: 4" x 3/4"
Gold tone cast awards are vacuum plated (not electroplated) for a budget trophy that looks good, but is not a guaranteed finish. The figure is mounted on a round plastic base. 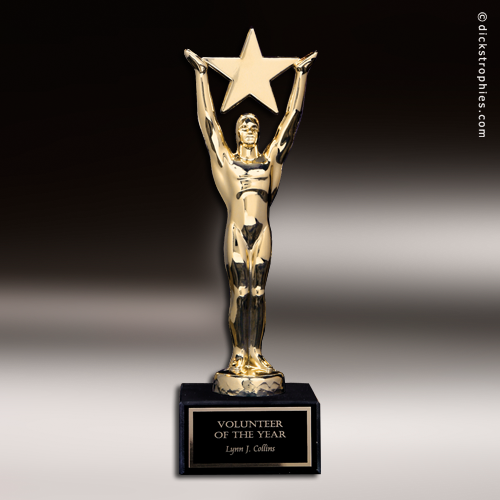 Gold tone cast awards are vacuum plated (not electroplated) for a budget trophy that looks good, but is not a guaranteed finish. The figure is mounted on a weighted molded base. 24 Karat Gold finished award figure in the Classic Pose holds a shining star of Achievement proudly. Mounted on black marble base. 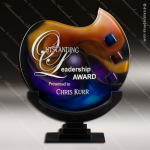 8 3/4" Imprint: 2" x 1"
10 1/2" Imprint: 2 1/2" x 1"
14" Imprint: 3" x 1 3/4"
Vakeel Andromeda extraordinary tones of purple and orange Art Glass award with diamond accents and black cast stone base. All art glass pieces are hand made to ensure no two pieces are identical. With a variety of sizes, shapes and colors, each piece is attached to a attractive base that can be personalized. This ultra-modern recognition of excellence is a uniquely styled abstract design that will add beauty where ever it is displayed. Valencia Flame shots of light punctuate the earthy reds and browns of this star fire Art Glass award with a black marble base. All art glass pieces are hand made to ensure no two pieces are identical. With a variety of sizes, shapes and colors, each piece is attached to a attractive base that can be personalized. 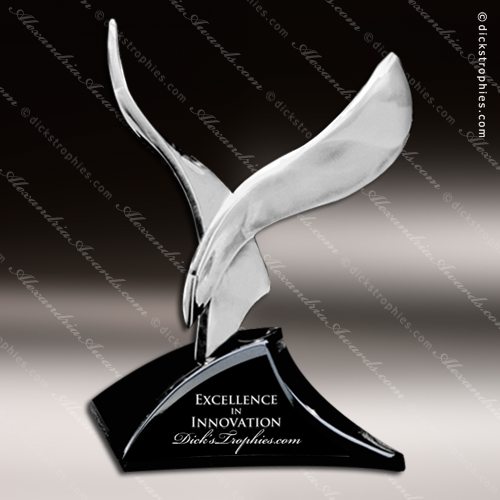 This ultra-modern recognition of excellence is a uniquely styled abstract design that will add beauty where ever it is displayed.